Home BOLLYWOOD Sultan Salman Khan Does Not Want To Disappoint Aishwarya Rai Bachchan? Sultan Salman Khan Does Not Want To Disappoint Aishwarya Rai Bachchan? [tps_footer]Bollywood actor Salman Khan‘s much-awaited film ‘Sultan’s first teaser has released today and surprisingly, it has released two days before the release date. Earlier, Sultan teaser was supposed to release with Aishwarya Rai Bachchan‘s upcoming film ‘Sarbjit‘ teaser i.e on April 14. Both the films, ‘Sarbjit’ and ‘Sultan’ are the much-awaited films of the year and of course, it would have been a tough war if both the teasers would have released on the same date. With Salman Khan’s huge fan following, it was obvious that ‘Sultan‘ teaser might have crushed the magic of Aishwarya Rai Bachchan‘s ‘Sarbjit‘ teaser. Well, we wonder what might be the reason for releasing the teaser two days before the release date, but it seems Salman has shown his kindness for Aishwarya and did not want to disappoint her in any way by conquering over her film’s teaser. Also, soon after the new poster of ‘Sultan‘ was released yesterday, fans started trolling instead of appreciating. Fans rejoiced their favourite star’s new avatar but were also disappointed by the final outcome of the poster, which looked more of photoshopped. Since then, Twitteratis pulled down the poster by hilarious comments and it seems this didn’t go well with the makers of the film. In order to kill the troll; it seems the makers of the film planned to treat their fans with an amazing surprise and nothing could have been better that ‘Sultan‘ teaser. Nevertheless, the first teaser of the film is out and it’s unique in its self. Directed by Ali Abbas Zafar, ‘Sultan‘ is all set to release this Eid 2016. 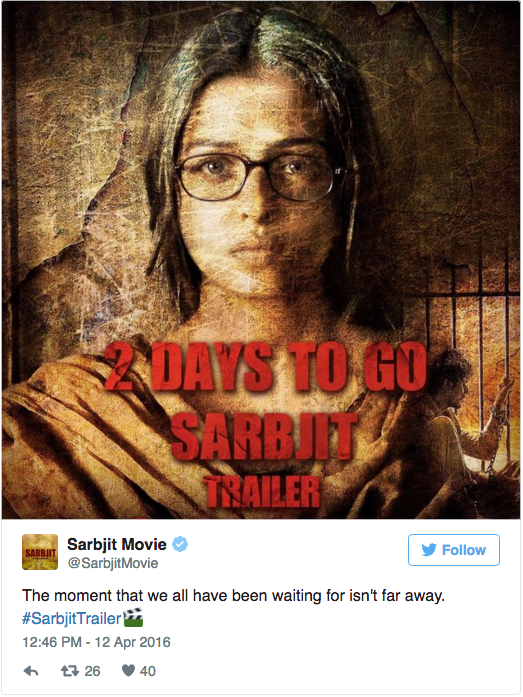 On the other hand, ‘Sarbjit’ will take the audiences through the untold story of the Indian slain prisoner Sarbjit who was imprisoned in Pakistan, mistaken for an Indian spy. Aishwarya Rai Bachchan will be seen in a de-glam mature look exuding real grit and pain as Dalbir Kaur. The first teaser of the film will release on April 14. Next articleTwitterati Trolls Makers Of Sasural Simar Ka For Copying Game Of Thrones!